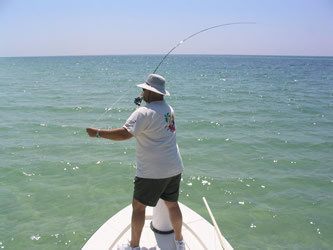 Fishing is always hot in the spring. 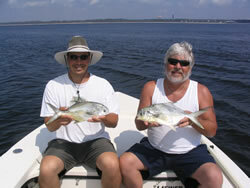 Pompano arrive in March and provide a terrific "bonefishing-like" experience on our Gulf of Mexico flats. 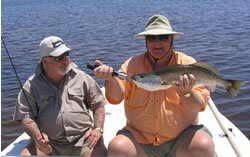 As you'll see by the photos, the redfishing is equally exciting. 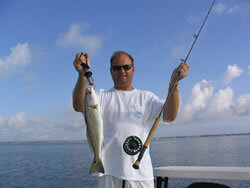 Our biggest trout of the year are usually caught in the spring. 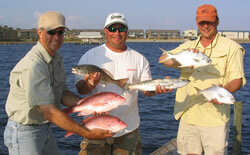 For anglers wanting to put fish on the table, we can usually count on red snapper, grouper, and the occasional cobia. 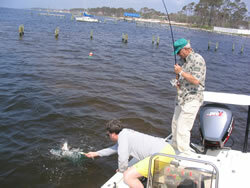 Click on any of the small images below to see the full size photos. Use the back button on your browser to return to this page. For additional photos visit the Photo Gallery Winter 2006, the Photo Gallery Winter 2005, the Photo Gallery Summer 2005, and the Photo Gallery Fall 2005 . 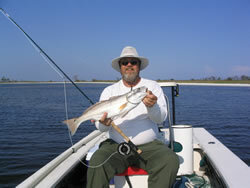 Bennett Miller of Arlington, VA takes a seat on the poling platform with a nice slot-sized redfish. 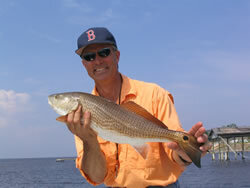 Florida Sportsman cover-worthy shot of NBC's "Car Guy"
Bill Laws of Columbus, MS and a late spring fly-caught redfish. This fish slammed one of Travis Akins' red/white poppers. An action shot of Bob and Rob Morrison taken May 10. 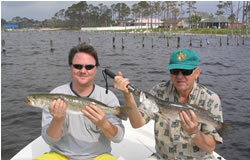 A couple of 4 pound speckled trout for the father-son duo of Bob and Rob Morrison. 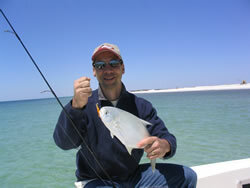 Birmingham's David Gilchrist and some excellent dinner fare landed on a cool spring morning. 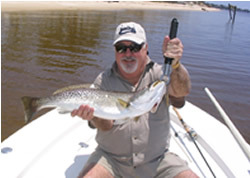 This tournament winner 27 inch redfish took a gold jig no more than ten feet from the beach. Justin Shields in the proud papa. 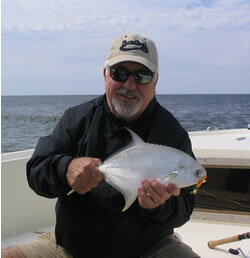 John Miles and one of eleven pompano landed on May 4. 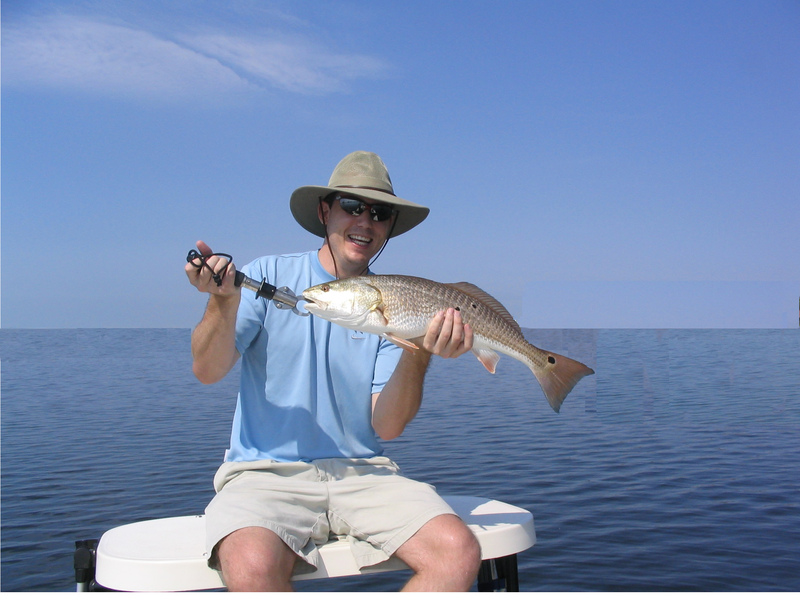 This lovely 25 inch redfish exploded on Mark Essert's red/white Travis Akins' popper. 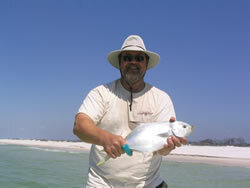 This three and a half pound pompano took Mark Essert's fly four feet from the beach. 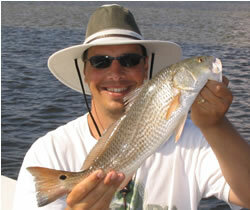 It was in a group of three fish swimming the shorebreak looking for sand fleas. 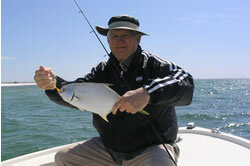 Rich Cacace looks happier than his catch on this "bluebird" April morning. 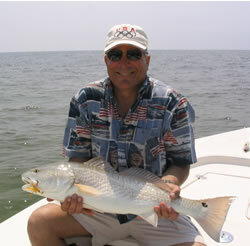 Captain Rick Harris and a 33 inch catch-and-release redfish landed in shallow water on light tackle. 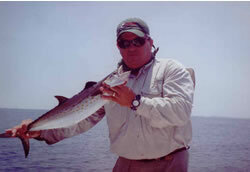 The 2005 boat record five pound Spanish mackerel landed May 6 by Captain Rick Harris. 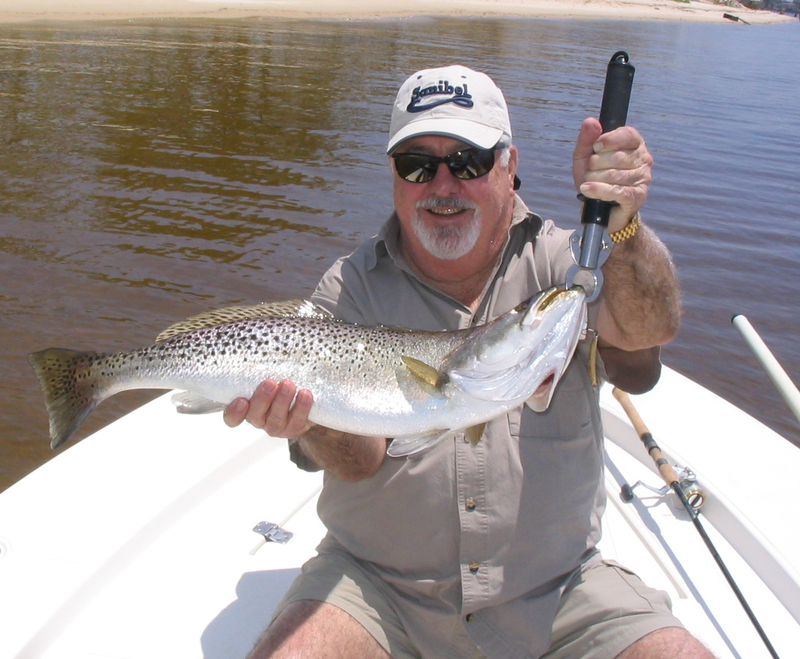 Beautiful 6# trout caught and released by Sam Mitchell of Greensboro, GA. We spotted this fish while poling a sand flat in 2' of water, and Sam made the perfect cast. 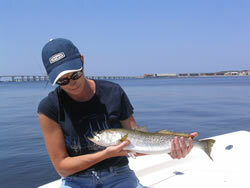 Sharron Cunningham, Bristol TN, landed this trout while walkin' the dog on a popular Gulf Breeze flat. Sharron's cap summarizes the day. A couple examples from a productive May morning for Shawn and Ronnie Williams, Fordland MO. 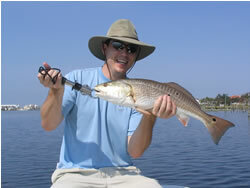 Slot-sized redfish caught by Shawn Williams on a Zara Spook, Jr. 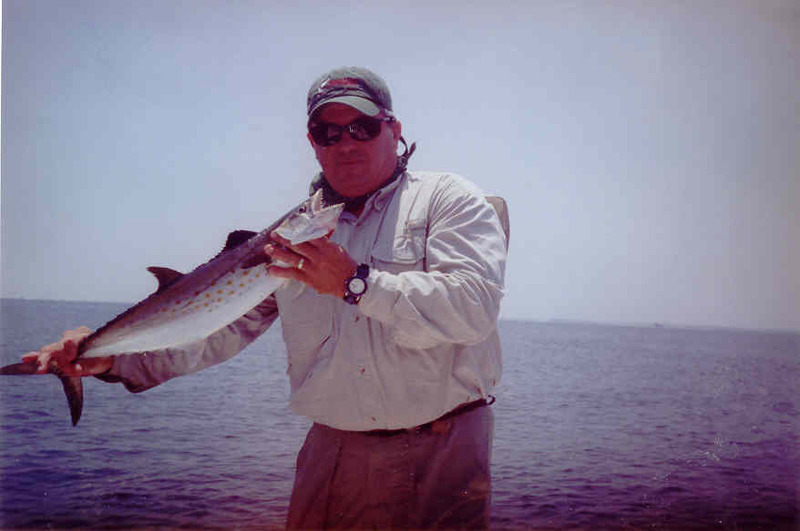 The 2005 boat record speckled trout landed by John Miles of Greensboro, GA. 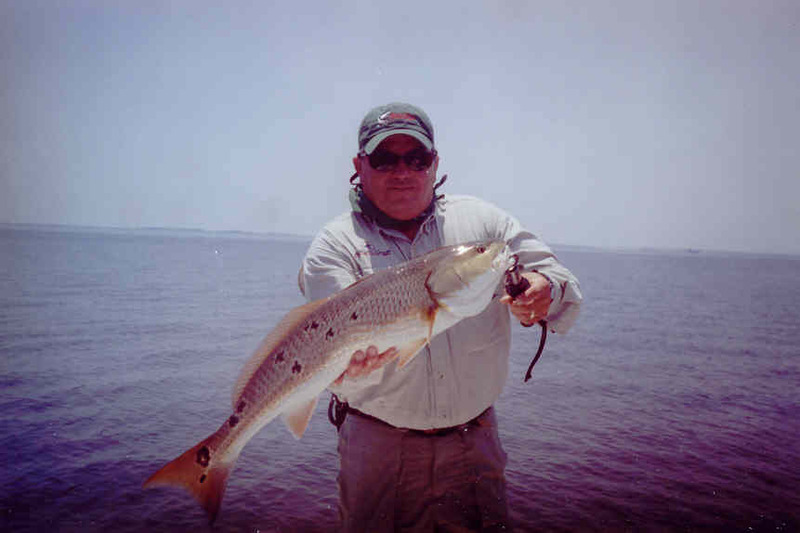 This fish weighed seven pounds and inhaled a gold sidewinder spoon.